Giant Ibis has wasted no time in becoming the foreigner favorite of all of the Cambodia bus companies. They’ve expanded their network by adding Phnom Penh to Sihanoukville and Phnom Penh to Kampot by mini-bus. These new mini-buses are what Giant Ibis uses for Phnom Penh to Kampot. Giant Ibis is known for their safe vehicles and experienced drivers, and this is true of their mini-buses as well as their larger buses. 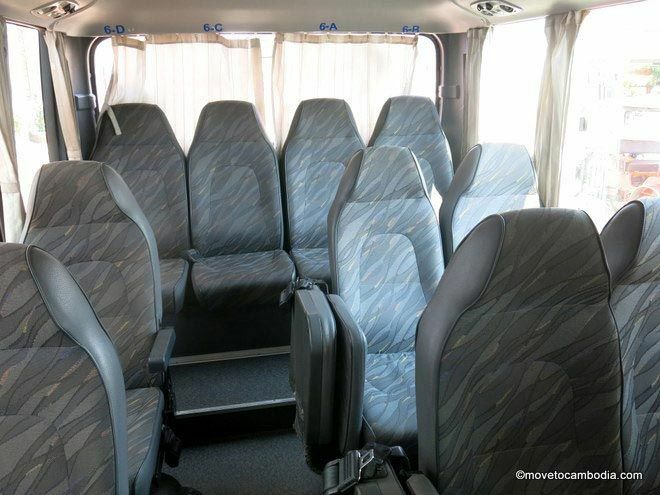 We tried out the Phnom Penh to Kampot Giant Ibis mini-bus recently and found that it was up to the usual Giant Ibis standards. Giant Ibis mini-bus seating chart: jump seats are in red. The Phnom Penh to Kampot route goes in a 21-seat mini-bus. 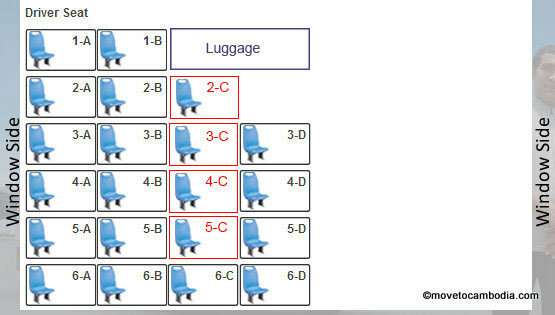 There are 17 regular seats and when the bus is fully booked, they pull out the additional four jump seats (seats 2C, 3C, 4C and 5C, as shown in the seating chart below). These seats are not ideal, as they are smaller and less comfortable, but for a short trip it’s not really a problem. The jumpseats are smaller, without a full back. The jump seats cannot be booked online and can only be booked by the Giant Ibis office or a travel agent if the other seats are already filled. This means if you are a group booking online and take seats in rows 2, 3, 4 or 5, be aware that you may end up with another passenger sitting between you. The last row, seats 6A, 6B, 6C, and 6D do not recline. When the buses are not fully booked, seats 3D, 4D and 5D are ideal for solo passengers because they are single seats (unless a jump seat comes into play). Move to Cambodia reader Sara reports the seat 1B has leg room than other seats because there is a raised area that means that the passenger in that seat needs to sit with their feet slightly elevated, so it’s not good for tall passengers. Is that complicated enough for you? Suffice to say, some seats are better than others but it’s a relatively short bus ride so it really doesn’t matter. The interior of the Giant Ibis bus used for the Phnom Penh to Kampot route. 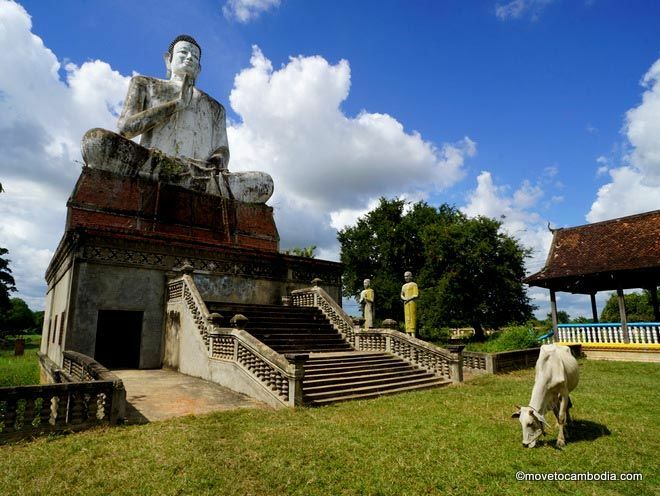 The trip from Phnom Penh to Kampot takes about three hours. As per usual Giant Ibis rules the drivers don’t go more than 95 kph/60 mph for safety reasons, but as the trip is only 150km/90 miles, it’s still a short journey. There is one quick bathroom break along the way. These days, they don’t usually play movies, but there’s usually WiFi. My experience is that the WiFi is not always reliable, so bring another form of entertainment. Tickets on Giant Ibis between Phnom Penh and Kampot cost $9. 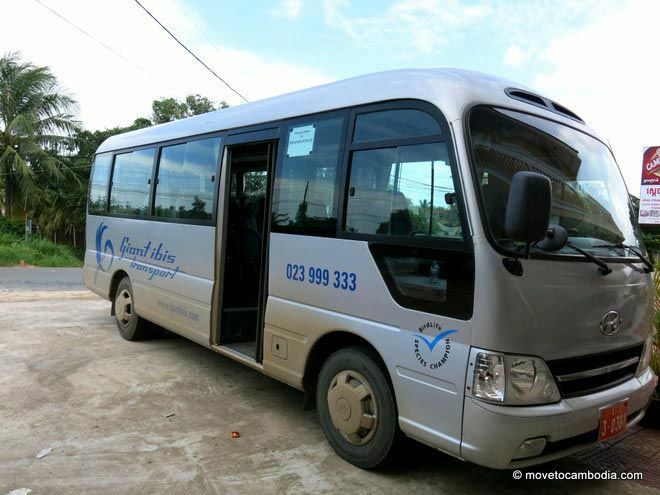 Unlike every other company that operates on this route, Giant Ibis charges the same price to Cambodians and foreigners, and as such, are my preferred means of transport (check out the other options for how to get from Phnom Penh to Kampot here). 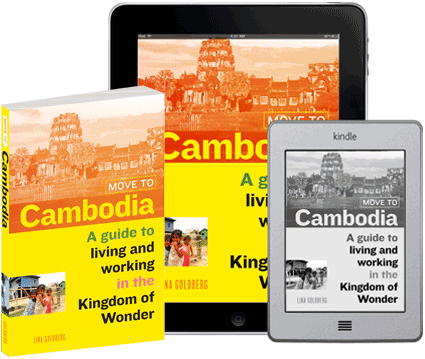 You can book at any travel agent or guesthouse in Phnom Penh or Kampot, or you can also book on the Giant Ibis website for an extra $1 and select your own seat. Phnom Penh – Kampot: 8:00 a.m, 2:45 p.m. This entry was posted in Kampot, Transportation and tagged Giant Ibis, Phnom Penh to Kampot, Kampot to Phnom Penh. Bookmark the permalink. GREAT information. I am having a hard time getting connected to the ibis bus website to book. Any idea how many days in advance i would need to book a ticket? Is 2 or 3 days enough?